Eventually it was going to end, even the Colgate players and defensive coaches talked last week privately about the consecutive game touchdown streak for the Raiders defense ending. 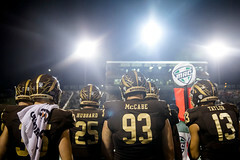 The historic streak, mentioned on ESPN’s College Gameday on Saturday before Colgate visited Lehigh, officially came to a close for the undefeated and No. 8 ranked Raiders in the second quarter against the Mountain Hawks. Colgate’s defense finally allowed a touchdown, but the 70 days and 29 quarters between those scores will go down as one of the most amazing runs by a major-college defense and earns the Raiders stingy and suffocating unit the Uplifting Athletes Rare Performance of the Week. 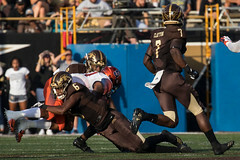 Lehigh faced third-and-8 from the Colgate 30-yard line early in the second quarter. Mountain Hawks quarterback Ray Falcone hit wide receiver Brad Mayes for a TD pass that capped a 65-yard drive at the 9:43 mark. That was the first touchdown the Raiders defense had surrendered since a fourth-quarter score by Holy Cross in Week 1 – a streak of 387 minutes, 16 seconds. Colgate had allowed a couple field goals in between touchdowns, but it has not come close to being pushed in a game since its season opener against Holy Cross and along the way registered five shutouts in the last eight games. Those five shutouts by the 2018 Patriot League champion ties an FCS record set by South Carolina State in 1978. Statistically through nine games the Raiders defense is surrendering only 56.7 yards per game on the ground, less than 2 yards per carry, have allowed only one touchdown in 12 red-zone tries and give up fewer than 200 total yards per game. This entry was posted in Colgate, Rare Disease Awareness, Uplifting Athletes. Bookmark the permalink.